The podcast that explores the no-nonsense strategies, secrets, and success stories of top performers in their field, giving podcast listeners an edge over the rest. You’ll learn things like, little-known ways to invest your 401(k), the best-kept tax secrets, how to maximize your retirement income and generate more time to do the things you love! From Millennials to Boomers and beyond, listeners of all ages will leave the podcast with actionable, bite-size bits you can capitalize on today! How many times have you generously donated to a worthy cause, only to have the sinking feeling that a majority of your money was gobbled up by administrative costs? 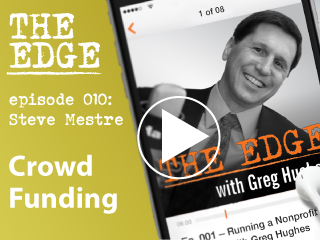 Our guest this episode, Steve Mestre, Co-Founder and Executive Director of GivingTrail.org, has solved these and other issues that plague charitable organizations through his ultra-efficient crowdfunding platform. Episode 009: Commercial vs. Residential Real Estate: Which Is the Smarter Investment? If you know me, you know that I’m always talking about the importance of diversifying your portfolio for safety and growth – particularly by investing in real estate. But what kind of real estate? In this episode of “The Edge,” my guest Matt Harris and I debate the age-old question: Is commercial or residential the better investment option? This episode’s guest, Joe Rajacic, never ceases to amaze me. Joe tells us how, after retiring from decades of flying a 747, he founded a non-profit called ALEX (Aerospace Learning EXperience). Using a flight simulator, he exposes young people to the joys of aviation. In addition to his work at ALEX, Joe pilots a Citation Jet and flies for a medical group that harvests donor organs. Tune in for more on this inspiring guest. 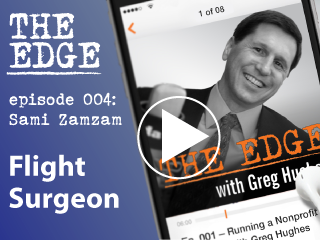 Angel Investor in Silicon Valley, Anesthesiologist, Major and Flight Surgeon in the Air Force Reserve, Real Estate Investor… Sami Zamzam does it all. Episode #004 features a fascinating guest who I’ve known for a long time as a Hughes Capital investor, but who I’ve only recently gotten to know on a more personal level. In this episode, Chris Askin, President and CEO of the Community Foundation of Western Nevada, explains how this innovative nonprofit treats giving like an investment. The Foundation gives donors the opportunity to choose the kind of legacy they’d like to leave, start their own fund, and even receive a return. Episode #002 casts a new light on an industry that has garnered its share of negativity: reverse mortgages. My guest, John Terveer, shows us how a reverse mortgage can be a powerful and flexible financial tool once you understand how to use it correctly. In this first episode of “The Edge with Greg Hughes,” Jason Morris, an attorney and estate planning expert, shared concrete takeaways on topics such as why trusts are essential, the consequences of not putting one together correctly, and the importance of keeping your trust up to date.